As one of Vice President Mike Pence’s three children, Charlotte Pence has spent much of her life with a first hand glimpse of big time politics. Whether it be his 12-year stint as a U.S. Congressman or his time spent as Indiana’s governor, no one in the Pence family, including Charlotte, could foresee the intense spotlight that focused on her father during the 2016 presidential election. Through that life-altering experience, Charlotte discovered that Mike Pence’s rich spiritual life always seemed to be a common thread in the many adverse challenges he faced and continues to face in his role as second in command to the president. 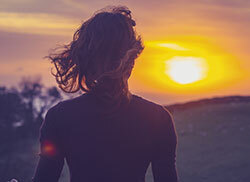 Charlotte’s discovery has led her to write, Where You Go: Life Lessons from my Father. From her experience of growing up in the Pence household through time spent on the campaign trail with her family, she offers readers valuable lessons learned over time from her father. I recently sat down with Charlotte to discuss how campaigning for president brought her family closer together, the most important life lessons her father has taught her, and why she believes he is a dreamer at heart. You are making the transition from a children’s book co-written with your mother to a much more adult book written with your father. Why the shift in genres? The first book we did was kind of a fun mother-daughter project. We wanted to encourage people to kind of learn a little bit more about the vice presidency, to teach them, and so we thought it would be fun to do it through the eyes of my bunny Marlon Bundo. So that was kind of a fun mother-daughter project to do, and then this book is also a tribute to my family and my parents, so to kind of transition into writing more adult books this one was kind of a natural fit. 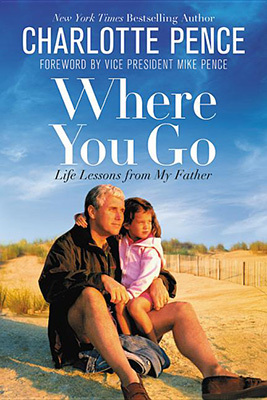 Your latest book, Where You Go, is a sampling of life lessons you have learned from your father, Vice President Mike Pence. What made you want to take this project on? Honestly, I really wanted to kind of encourage other people and share these positive stories and hopefully people will be able to relate to them. When I first was thinking about writing this book, it kind of came from an article I’d written for Glamour Magazine while we were on the campaign trail. (The article) was about things that my Dad had taught me and watching him on the campaign trail. The point of that article, though, as is this book, was that your Dad doesn’t have to be the Vice President for you to relate to this. There are lots of lessons here for everybody, and I think that hopefully people can learn from these wherever they are in life. If they’re going through a transition or not, they can think about how they’re teaching people around them every day and the people that are inspiring them. Let’s go back to the beginning. What was your Dad like growing up? My dad was very loving, encouraging. He was very present also which I talk about in the book. I think I have a lot of memories of him, because he really took the time with each of us individually. We actually grew up right outside of Washington, DC. When I was six, he was elected to Congress and we moved to DC. Because of that we really saw him all the time. He was home for dinner almost every night. If he had late votes, we would pick up takeout and bring it to Capitol Hill and have dinner with him. So that was kind of something that I didn’t think was abnormal when I was a little kid, and looking back I’m just really grateful that my parents really took the time to make sure that our family was always the priority. Has he changed at all since becoming a U.S. congressman, then Indiana governor, until now as vice president? I believe he joined the House when you are about six years old. That’s a good question. I don’t think I’ve seen a change really. I think that he’s continued to be present and share advice. When I was a kid, he was at my soccer games or my plays. Now, as an adult, I see that same presence and involvement in our life just through the fact that I can reach him anytime. He always answers his phone. When he was governor he answered his phone sometimes, and I would start talking and he would be in a meeting, and then I would realize he was in a meeting and be like, “Dad why did you answer your phone?” But he’ll always answer like that. He’s always put his family first, and that has remained constant. With that said, what are some important life lessons he’s taught you over the years? One really important lesson he’s taught me is to go after your dreams and to trust God even when you’re not really sure of how something’s going to turn out. He has always encouraged me to really pray about it and trust God with it even when people don’t necessarily understand why you’re doing something. 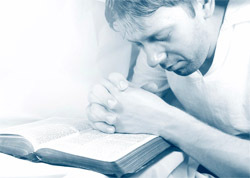 So I think that playing his faith first in his life is something that I’ve learned a lot from. Is there any one-life lesson that you feel is the most important? I would say one of the most important ones is definitely that he leads by example, and I can kind of see him doing that on a daily basis. Especially on the campaign trail, he would often say things; he says to me, that everyone is under-encouraged, and that’s a line that he says a lot; and I think it’s really true. I think everybody needs more encouragement in their life, and so he would always encourage people on every level on the campaign trail. I’ve learned from watching him do that. The Bible teaches us that the fruits of the spirit are love, joy, peace, kindness, goodness, faithfulness, gentleness, and self-control. Which one of these do you think your father, the vice president of the United States, is strongest in? That’s hard. I often say that he is a very calming and has a patient presence. I think that kindness is something that he demonstrates very well. Those are a couple I would point out, but I think that he always takes the time with people, and he takes the time with my siblings and I. I see him do that, even when I’m sure he has a lot on his mind; and it’s encouraged me to do that with people, too, to give people my time, because sometimes that’s what they need most. In preparing for this interview I came across some information that called your father a dreamer. Is he a dreamer? If so, what makes him this? Oh, yes, definitely. He is a dreamer. He has always encouraged my siblings and I to kind of go after our dreams which have always been very different, and I talk about that in the book a lot, about how different the three of us are and how my parents always encouraged us to find the thing that we really loved that gave us life, that was our passion. So, I think he absolutely is a dreamer, and I think that he and my mom both definitely just kind of go forward in faith not knowing how things will turn out, and I think you have to be a dreamer to do that. He’s a big believer in the American dream. He always talks about that. He says in America anybody can be anybody. That was a big line on the campaign trail he said a lot. That was really cool for me to see him encourage Americans in that way. So he’s definitely a believer in dreaming big. I can imagine that the campaigning process leading up to the last presidential election can take a lot out of a family including the children. How has that pivotal run to the White House changed you as a person? What did you learn about yourself during this process? I don’t know if it changed me individually. Maybe in coming years I’ll look back and say, “Oh, this is how I grew up during that time.” As a family I think we definitely grew closer, and we were very close before, but I think that going through that experience and just communicating through that experience and also just having the open dialogue and all talking about things together was really important for us. I think that it taught me to just keep that dialogue open in my family, and we became very close from it, even closer than we were. What is your greatest hope for Where You Go? I’m hoping that people realize that they can relate to these stories even if they’re not from a political family. You definitely do get an inside look into the life of a political kid, because I am one; but I also think they’re just fun, uplifting stories. It’s just a fun read if you want to be inspired and be able to just have a positive message. 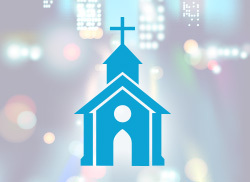 Does the Bible Teach that Once I Am Saved, I Am Always Saved?